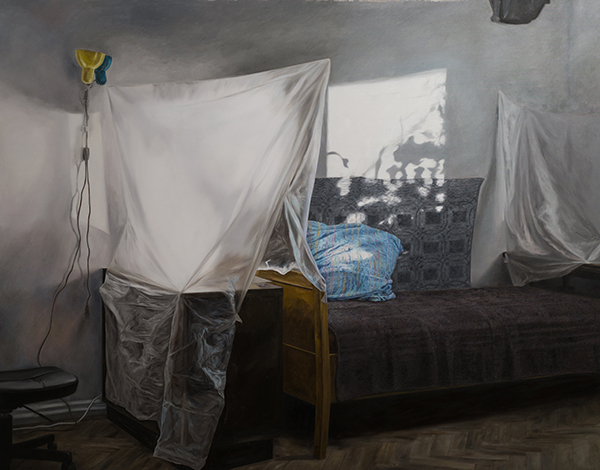 Ana Maria Micu's paintings are based on photographs the artist took of her immediate surroundings: a typical Romanian apartment built in the Communist Era that she uses for both living and working. Micu has long occupied spaces like these, moving from one apartment to another only to encounter the same architectural and design principles repeatedly failing her needs. Over the years, the artist has developed an appreciation for the mechanisms she has had to invent in such spaces in order to successfully merge her household with her artistic practice. In her low-key, unassuming images, the artist eschews the intimate aspects of her life, and instead experiments with the larger meanings to be found within the domestic and the banal. long-term coping ... shelter and local, 2018, oil on canvas, 145 x 185 cm. the calm, ... Is this pattern, 2018, oil on canvas, 192 x 72 cm.